ExBalance is not required to run this mod. 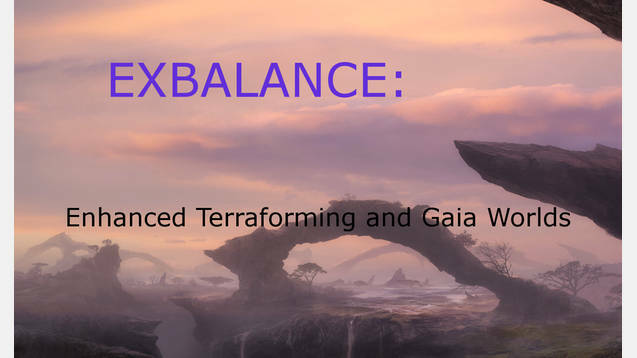 This mod enhances the existing terraforming system while remaining within the same paradigm. No vanilla files are overwritten so this mod is 100% compatible with all other mods. It is also 100% savegame compatible. This modifier gives a small +5% habitability / +5% border extrusion bonuses. It reflect the fact this planet’s ecology and geosphere has been optimized, as well as the long term influence impact of such a monumental undertaking. The reasoning here is the creation of artificial landmasses and huge scale land reclamation as part of the terraforming process. Mechanic-wise this works thus: when terraforming a planet below 23 in size, there is a 50% it will increase in 1 tile, 40% for 2 tiles and 10% it will increase in 3 tiles. When terraforming a size 23 or 24 planet, it will always increase in 1 tile. This function will work only the first time a planet is terraformed to prevent abuse. All Gaia planets get a special modifier called “Gaia World”, which gives +50% migration attraction / +20% pop growth / +10% happiness and the planet itself generates +10 unity. This modifier is added to all planets terraformed to Gaia. It is also added to all gaia planets at game start, and there is also a monthly (invisible) event that checks every month if all Gaia planets have this modifier, and in case they don’t adds it, therefore making sure even games not started with this mod enabled will get 100% of its functions. This mod removes the restriction from Frontier Clinic/Hospital building that prevents these being constructed on Gaia worlds and Ringworlds. This is the same change that exists in the main ExBalance mod and is 100% compatible with it. To prevent a situation where your climate preferance planets become sub-optimal, this mod allows you to terraform a planet into the same climate type. The idea here is a sort of ecological optimization, rather than actual terraforming. This costs slightly less and takes slightly less time than it costs to terraform to another climate type from the same category, and the terraformed planet receives the terraformed modifier and the tile size increase. PLZ rate this mod if you like it! This really helps making the mod more visible on the workshop. And if you don’t like it, tell me how you’d improve it.